Louise and I read a lot of nonfiction, but we both enjoy fiction as well. 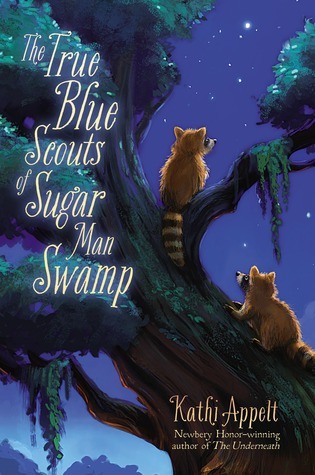 Last week I read The True Blue Scouts of Sugar Man Swamp by Kathi Appelt. The Ivory-billed Woodpecker plays an important role in this middle grade novel set in the swamps of Texas. When I finished Appelt's story, I found myself longing to revisit The Race to Save the Lord God Bird. I'm a big fan of Phillip Hoose's nonfiction books. His writing immediately pulls in readers and transports them into the story. In The Race to Save the Lord God Bird, Hoose sheds light on events that led to the possible extinction of the Ivory-billed Woodpecker. Museums that paid naturalists to hunt and stuff rare birds, fashion that included bird feathers in women's hats, and clearcutting forests across the southeast are some of the factors that led to the demise of the rare woodpecker. "Alexander Wilson clucked his horse slowly along the margin of a swamp in North Carolina. Bending forward in the saddle, he squinted out at the small birds that flitted across the moss-bearded boughs of giant cypress trees, hoping he could get a clear shot without going into the water. When he heard the first call of the Ivory-billed Woodpecker, he knew what it was instantly, even though he had never seen one before" (p. 7). Readers will feel like they are a part of James Tanner's 1938 expedition to the Singer Tract in Louisiana as he studies and documents nesting Ivory-billed Woodpeckers. "One winter morning he made his way to an Ivory-bill roost tree while it was still dark, hours before the woodpeckers would be active. Plumping up on a cushion of palmetto fronds, he settled himself against a tree to hear the forest wake up. It was great entertainment, he thought, and he didn't even need a ticket" (p. 103). Even though the loss of the Ivory-billed Woodpecker leaves readers with a sense of sadness, the book ends on a hopeful note as Hoose points out how far we come in protecting our environment. Part science, part history, this superlative example of nonfiction writing would make an excellent read aloud for a middle school or high school class. Recent possible Ivory-billed sightings will also intrigue readers and could lead to further reading and research for inquisitive students. The source notes provided for each chapter serve as a strong example to students of what thorough research looks like. Hoose used interviews, articles, books, and a research trip to Cuba to write the book. 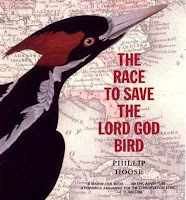 Display The Race to Save the Lord God Bird with Moonbird by Phillip Hoose, Look Up! : Bird Watching in Your Own Back Yard by Annette LeBlanc Cate, and Citizen Scientists by Loree Griffin Burns. Click here to listen to recordings of the Ivory-billed Woodpecker. Click here to listen to an NPR interview with Phillip Hoose on the "Significance of the Ivory-Billed Woodpecker." This sounds great, and clearly I need to read some Phillip Hoose. Thanks! Looks great! I like She's Wearing A Bird on Her Head as a book to read alongside as well and The Last Egret.